After a natural disaster, Shangri-La lays in ashes. Aerie and the will-o-wisps are called upon to bring the land back to life. Guide them through forests, mountains, swamps and snowy peaks as they heal many different plants and trees. Awaken slumbering animals and cure them - they will give you valuable resources to heal nature’s wounds. 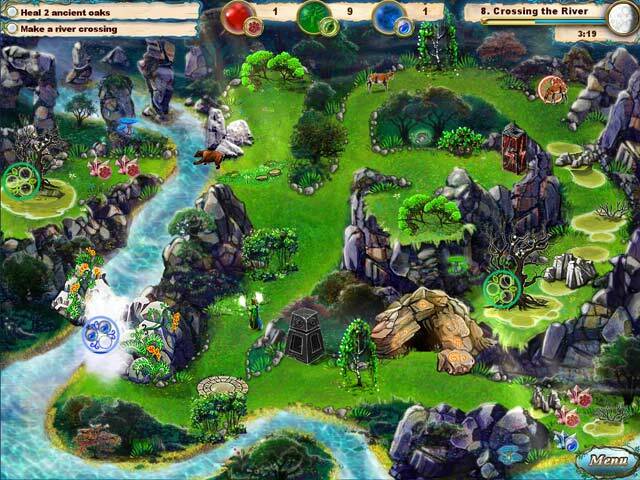 Use strategic thinking to repair the planet in this fun Strategy game, Aerie – Spirit of the Forest! 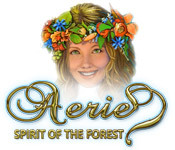 Aerie - Spirit of the Forest is rated 3.6 out of 5 by 9. Rated 5 out of 5 by kattykit from A favorite I just finished playing this game and would list it as one of my favorite time management game. It is unique in this category. Beautiful graphics, plenty of challenge, fun story. Highly recommended! Rated 5 out of 5 by ccorrin from Great Game I enjoyed this game a lot. I've played it several times. Rated 5 out of 5 by Bullionist from Beautiful game Beautiful graphics and music, great gameplay. You get to heal the forest using mana, will-o-wisps and quite a few different kinds of animals who help you. The forest scenes and especially the lighting effects look great. The atmosphere is always so pleasant that the game isn't stressful, but it can be fairly challenging in later levels. You have to choose your strategy carefully if you want to finish healing the forest during the right moon phase so that you can get the moonstones to restore the nature temples. However, it was always fun to replay the same levels over again and it never felt frustrating. I finished this game some time ago and still enjoy replaying it. I wish there were more like it! Rated 5 out of 5 by Zeli7 from Great Time Management Game I just loved this game. Thoroughly enjoyed playing it. Loved its theme of "saving the planet". I found it quite challenging timewise, and sometimes it took a number of attempts to actually pass the level. Great game to build an awareness of needing to heal nature in kids. Rated 4 out of 5 by Katwoman55 from Beautiful but not overly challenging Lovely graphics and a good story. It was fairly easy though and didn't provide much of a challenge gameplay wise. Overall I did like it but won't be replaying it as much as other games. Probably great for tweens! Rated 4 out of 5 by Imp22 from Challenging game for TM lovers This is a pretty game, with relaxing music. The game play, however, is anything but relaxing. The timer seems real short, even for a TM game. While it’s true that you can finish the level, even though the time has elapsed, you won’t be given the moon stones that are needed to repair the Temples, unless you complete before the timer runs out. You are given the help of a will-o-wisp to start out each level, and can release a second one. You have to keep a sharp eye on your resources or you can’t repair damage and it can get tedious to have to go collect more water, seeds or life force when they are away from the area you are trying to fix. 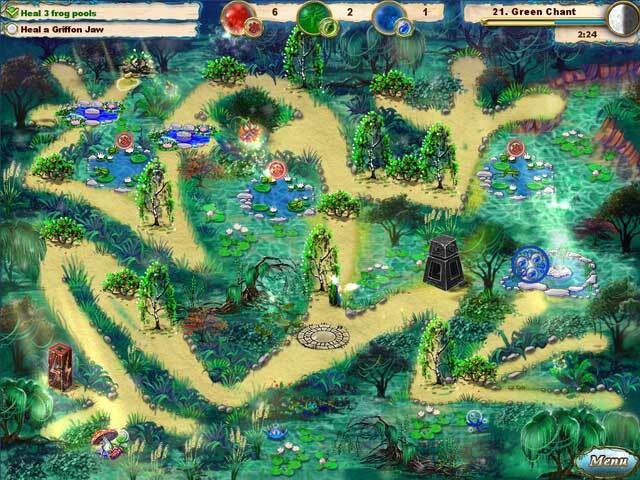 There are also hidden objects, such as mushrooms or mountain crystals, in each level. I haven’t played this game start to finish yet, but I feel the length is good and the replay-ability is high. I am not really a rush around TM fan, but this game was intriguing and fun enough for me to want to continue. I will finish and most likely, replay this one. In a nut shell… If you like the CHALLENGE of a short timer… and to-ing & fro-ing, you will LOVE this game, and to you… I recommend this game. If however you find short timers too frustrating... don’t waste your money on this one… not even as a Daily Deal. Rated 2 out of 5 by JennyerSuper from Mediocre at best I found this game to be thoroughly average. The graphics weren't great and the story was lacking. The level of challenge was extremely disappointing, in the entire game there was only one level I had to retry in order to beat, and it only required one retry at that. The final level was even accomplished with plenty of time left over at the end. This game took me about three hours to beat from beginning to end, I wouldn't waste a credit or money on it if I were you. Rated 1 out of 5 by randnsmama2 from Slow moving game This game is so boring! It takes so long for the characters to get to the task that you spend a lot of time just sitting. Since you can't stack tasks, the levels take a long time to finish. I expect to have to manage my time in time management games, not just sit. Rated 1 out of 5 by kjwhitlock22 from Horrible Graphics I felt like I was playing an Atari game. After a natural disaster, Shangri-La lays in ashes. Aerie and the will-o-wisps are called upon to bring the land back to life!